Adding new coffee grounds to coffee that has already been used. My mother often adds a few scoops of fresh grounds to some that she brewed a few hours ago all the way up to some from the day before. I am curious to know if the used portion would have any viable resources (ie; nutrients/caffeine)? Well, I wouldn’t recommend it. 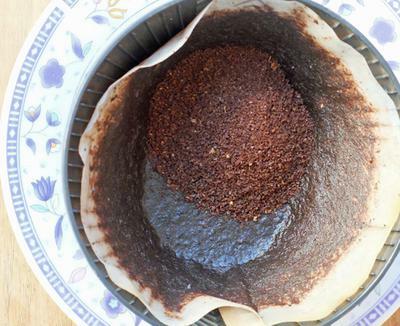 Is there any flavor and caffeine left in used coffee grounds? Yes, a little. So your mother can save a little money each week doing what she does. The downside is the sacrifice in taste. There is a reason that a decent drip brewer will run water through the coffee grounds for about 4 minutes. The same goes for waiting 4 minutes when using a French press. Less than 4 minutes means you are under-extracting the coffee and not getting the strength and flavors you want. More than 4 minutes means you are over-extracting. And the most noticeable thing about over-extracted coffee is its bitterness. So when your mom uses old grounds again, even with the addition of new coffee, she is hugely over-extracting that first batch and drawing out a lot of bitter taste into the second brew. In a nutshell, the second brew will taste horrible compared to the first. But, of course, it’s all relative. If you are using Maxwell House coffee and the quality of the taste come a far second to the habit of just having a hot mug of coffee, and the caffeine kick it provides, then maybe it’s not such a big deal. Also, back in the days of “cowboy coffee” it was common for people to keep adding new coffee grounds to the old. That’s the coffee they were used to, and for them it tasted just fine. But if you buy decent gourmet coffee and appreciate its finer flavors, your mom’s approach is not a good idea at all.